As I stepped off of the train, it was immediately clear to me that Akihabara does not appeal to the general taste of Tokyo’s homogenous culture; it caters toward a highly specific niche. There was a bout of heavy rain so I threw on my hood and turned my gaze to the neon signs on each looming black tower, most advertising anime I had neither heard of nor seen before. Other Puget Sound students enjoying the sights and sounds of Akihabara. 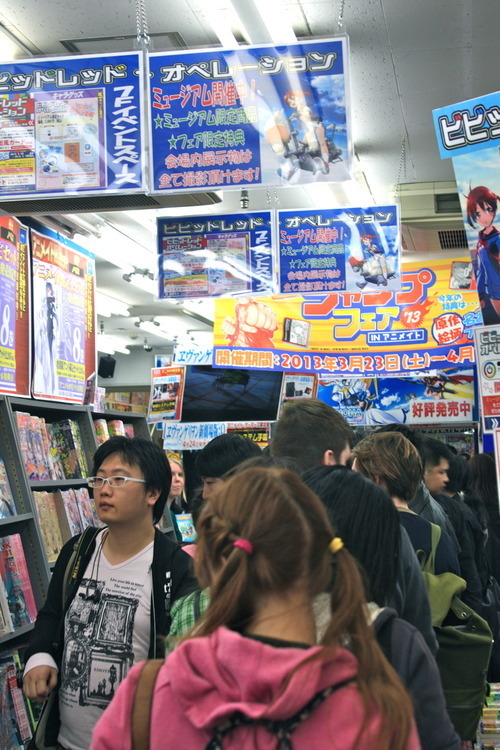 I realized then that even for the most seasoned otaku, Akihabara represents a place of mystery, where something new and inviting need only be plucked from a store’s cornucopian selection of anime, manga and video games. It is the place where new fans are born. My first stop was the nearest Book Off, a ten-floor megastore where I was able to find used manga versions of a few of my favorite anime, including Naruto, Full Metal Alchemist, Death Note and Attack on Titan, all for roughly $10. 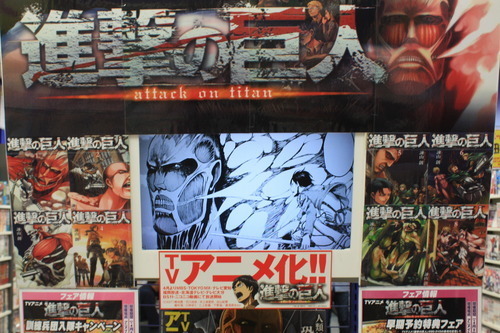 Here is a store’s display for the gruesome shonen-turned-anime, Attack on Titan, which depicts a post-apocalyptic universe wherein humans live in high-walled cities, fighting for their lives against droves of hungry Titans. Finally having pulled myself away from the store’s beckoning shelves, I met up with some other students on my program and checked out a similarly vast anime merchandise store. My friend Eva’s pigtails fit right in with this particular store. The building itself had eight levels, one for anime soundtracks, one for posters, plush toys and other memorabilia, one for shonen and shojo manga, one for clothing and cosplay outfits and even one level was devoted specifically to hosting card game tournaments. Miraculously, I walked out having not purchased anything, but that was mostly due to the merchandise’s steep prices (one of my friends spent $40 on a figurine from the Final Fantasy series). 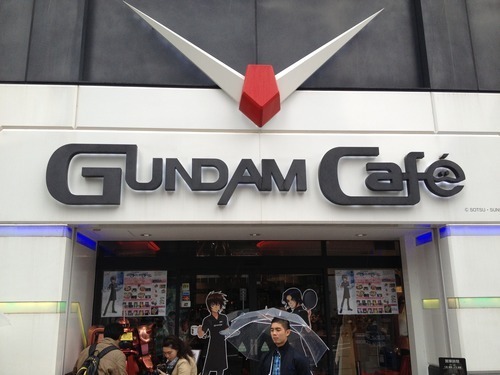 From there, we walked over to the central area to take a look at the Gundam Café, inspired by the sensational mechanime, Gundam Wing, where food such as “Heero Yui curry” and various Gundam-themed merchandise were sold. This is a view from outside the café. 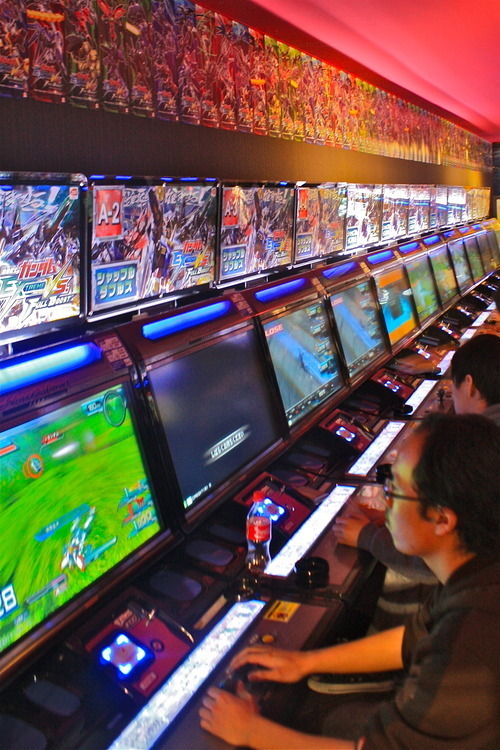 While others were purchasing gifts for friends, I also dipped into the building next door where gamers ferociously waged war on each other, sitting shoulder-to-shoulder in the online Gundam Wing arcade. I would have stayed and tried a game but I resisted the urge so that I’d be able to afford the day’s main event: attending a “neko café,” or cat café. 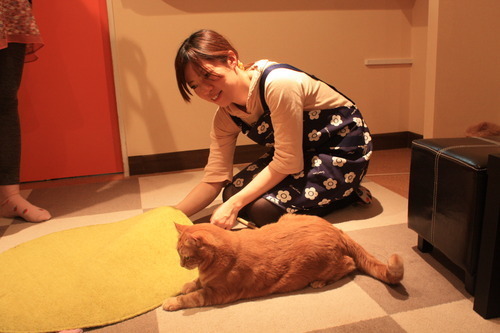 Found not only in Japan but also throughout Asia, neko cafés are often expensive but well worth the money for any avid cat-lovers like myself. 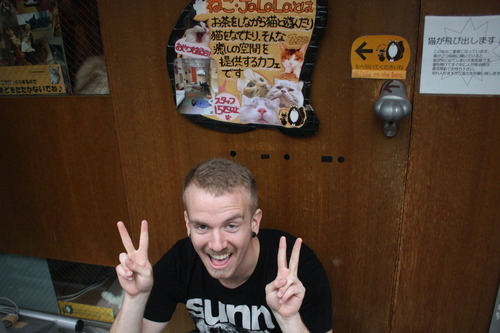 Some other students and I had decided on a place nearby, Neko JaLaLa, where each of us spent around $10 plus the price of a drink to spend thirty minutes with some seriously sociable cats. 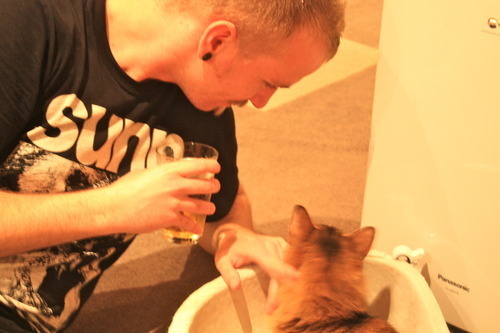 I decided on beer because I mean really, what could be better than beer and cats? Perhaps beer and cats and catnip, which the café actually had, though I unfortunately didn’t have the cash to buy some. 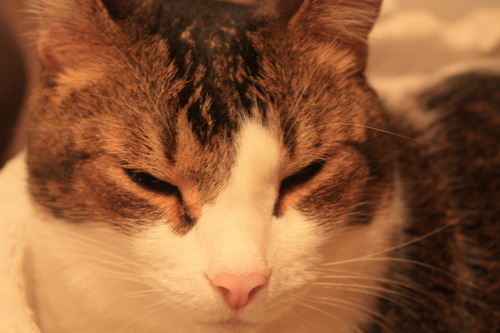 I particularly bonded with a cat whose Doppelganger was nothing short of Garfield himself. 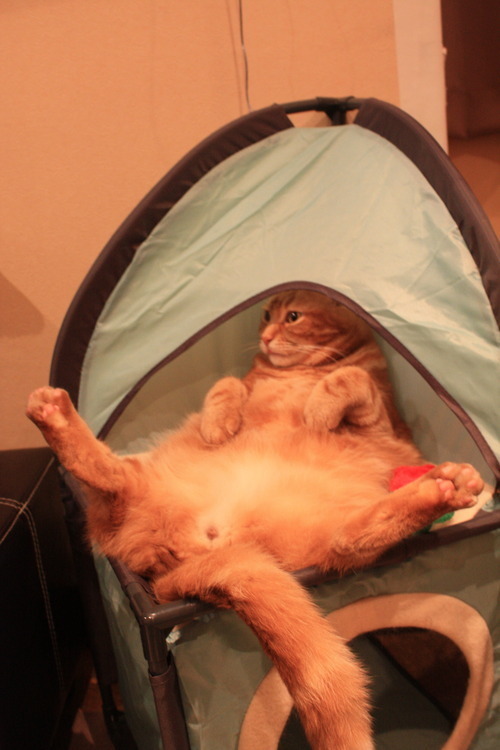 He was a fat, orange tabby with an ambivalent demeanor that seemed to inherently mirror the comic genius of Garfield’s own character. “Maybe I’ll pounce on it… I guess that could be worth the effort,” he seemed to be thinking as the store clerk toyed with him. Having tired ourselves out, as well as the café’s ten or so cats, the five of us walked back to the Akihabara station, boarded our trains and went home. At last, matching the spirit of my new feline friends, I allowed no time to waste before brushing the raindrops from my whiskers and taking a well-deserved catnap. 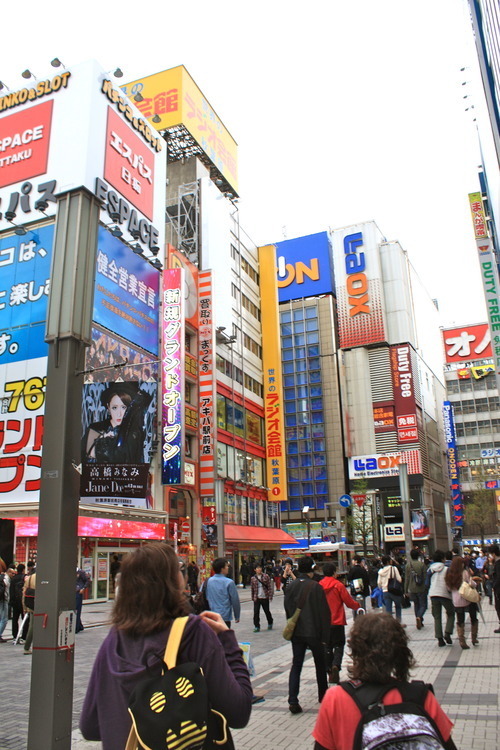 This entry was posted in Tommy Stone '14, Japan and tagged akihabara, tokyo, travel blog. Bookmark the permalink.